Admit it. We all love new cars. And not just for the convenience. But also the glam that comes with them. Sadly, there’s that one significant downside- costs. Of course, dealerships will always scream that they have the best prices in town. And might even introduce you to a couple of models on special sale prices. But overall, you still have to dig deep into your pockets. Buying a new car is not an easy feat, to say the least. And that alone complicates everything, especially if you need one urgently and on a temporary basis. Well, at least not entirely. It’s still possible to get a new car without actually buying one. By now, I assume that you’ve heard about car leasing. It has been the magical option for decades now. Came quite handy when you needed a vehicle only for a limited period of time. However, going by recent trends, leasing has morphed into a different thing altogether. It’s not just for travelers and temporary drivers anymore. Everyone is going for it. In the past five years alone, car leasing volume has increased astronomically by 91%. Source: Edmunds Millennials are particularly fond of this option. Of the lot that got new vehicles in 2016, at least 31% of them did it through leasing. Source: Edmunds What’s the catch? For starters, its way cheaper than actually purchasing a new car. Including when you alternatively choose to buy your car through financing on monthly payments. Here’s the interesting bit. On average, car buyers are now paying about $120 more a month than their leasing counterparts. Let’s be honest. It has something to do with the fact that financiers are in for the long ball when it comes to profits. To be fair, however, leasing also has its sets of problems. With the principal one being lack of adequate information about the whole concept. Most of what we see are marketing campaigns by leasing dealerships. No one likes going into those finer details because they might spoil the party. Insurance, for instance, is rarely mentioned by anyone. Even the State of Michigan hardly delves into the subject. If you’ve been following this blog, you know that auto insurance is compulsory. And not just in Michigan, but also the rest of the country. What varies, however, are the actual policies. But, it’s mostly only associated with cars that have been bought. And that begs the question. Do you need different auto insurance if you lease a car? Well, your car lease dealership has probably introduced you to this thing they call lease insurance. And even told that you that it’s compulsory. Here’s the hard truth. It turns out they are right. That means you should go ahead and mark the lease insurance checkbox on the form, right? Now, hold it right there. That’s where they go wrong. They may be right about one thing, but there’s a lot they haven’t told you. Thankfully, we have your back. We’ll cover the most critical aspects of lease insurance. And then tell you why you shouldn’t rush to accept your dealer’s offer. So let’s dive in and look at the basics first. What is Lease Insurance? Going by information published by Michigan State Police, more than half a million vehicles were involved in road crashes last year. And no specific type or model was spared. Passenger cars, SUVs, and Vans led the list with a combined figure of slightly over 400,000. Pickup trucks come second, then small trucks at a distant third. You might assume that it all ends there. But surprisingly, even vehicles like motorhomes, snowmobiles, and ATVs were part of the drama. And sadly, it didn’t end so well for some of the occupants. 1,733 of the crashes were fatal, while 109,682 ended in injuries. Overall, more than 433,157 of the vehicles also caused property damage. Source: Michigan The point? Evidently, no vehicle is safe from a traffic crash and potential carnage. Including leased vehicles. And the State of Michigan knows this all too well. As a result, no one is exempted from the compulsory no-fault insurance. That usually forms the first part of lease insurance. It comes with: ● Personal Injury Protection: This coverage grants you full reimbursement for medical expenses incurred as a result of a traffic crash. The insurance provider also caters for attendant care and pays a fraction of the lost income. ● Property Protection Insurance: If you end up crashing and damaging property or other stationary vehicles, this is the coverage you fall back on. It only applies to incidences within the state of Michigan. ● Property Damage: This is pretty similar to Property Protection Insurance. The only difference is the fact that it fundamentally applies to incidences outside the state of Michigan. ● Residual Bodily Injury Liability: This is applicable to traffic crashes that cause third-party injuries. The insurance company takes care of the resultant medical expenses. But what happens when the car you’ve leased is owned by someone already covered? Wouldn’t that be good enough? According to the Department of Insurance and Financial Services, you’re considered the owner of a vehicle if you lease it for more than 30 days. That essentially makes it compulsory to purchase this insurance of the lease period stretches past one month. Come to think of it, the insurance is reasonably fair for parties involved. Quite a solid set of coverage there, to be honest. But take another look. Assess it much deeper this time. Notice anything missing? One prominent party has been left out. The dealership or individual that actually owns the car you’ve leased. The state makes no mention of any coverage for the vehicle you’re driving in the event of a road crash. As far as they’re concerned, you can even wrap it and send it to the moon. All they care about, apart from your health, is reimbursing third parties. So, do the actual vehicle owners stand a chance of losing their investment? Well, that forms the second part of lease insurance. It basically protects the car owners from potential loss of their vehicle. All factors considered, they actually face more risks than you. A crash is only one part of the potential problems. They could still lose their vehicle through theft, fire or natural disasters. To make matters worse, cases of vehicle theft in the U.S have been increasing since 2014. 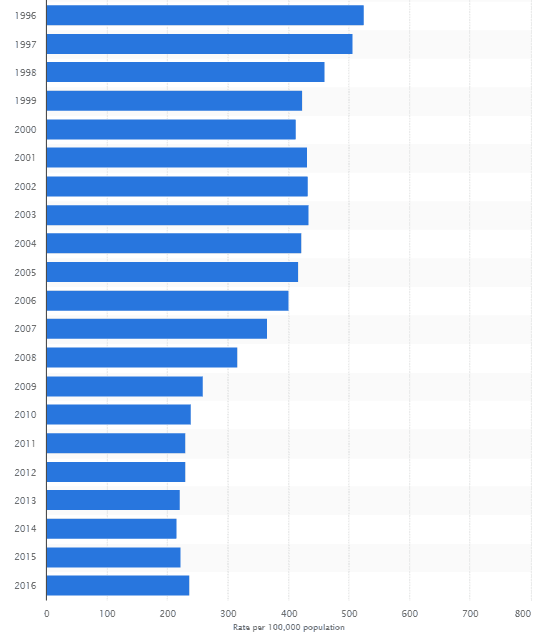 After trending downward for 25 years. Are thieves getting smarter? Source: Statista According to FBI’s Uniform Crime Report, thugs made away with 765, 484 vehicles in 2016. Translates to 239.6 cars for every 100,000 people. A disappointing 6.6% rise compared to the previous year. Source: FBI And since today’s cars cost more than previous models, these cases translate to significant financial losses. In actual figures, Americans lost about $5.9 billion in 2016 alone. Now, review this really critically. Not as leaser. But rather as a car owner. Well, you’re dead right. Your leased car’s owners want none of this. That’s why in addition to no-fault insurance, you’ll also be required to get comprehensive auto insurance. Collectively, they make up a typical lease car insurance. So, does it operate within the same framework as regular auto insurance? No. Not quite exactly. There are certain crucial elements that you should always remember. Important Facts About Lease Car Insurance ● It Might Cost More Than Regular Auto Insurance Admittedly, leasing has been attractive because of its comparatively low costs. But sadly, it’s not a fairy tale bed of roses. And lease insurance cost is the culprit here. As we’ve discussed, you’ll have to take insurance against two levels or risks. The no-fault insurance applies to you as the driver, while comprehensive insurance protects the car owners. Sounds good to some extent. But quite a different tale when it’s all translated to actual costs. Especially when you consider the fact that auto insurance rates have increased by 20% since 2011. Source: Zebra ● There Are Still Ways To Save on Lease Insurance Paying more for lease insurance is one thing in other states. 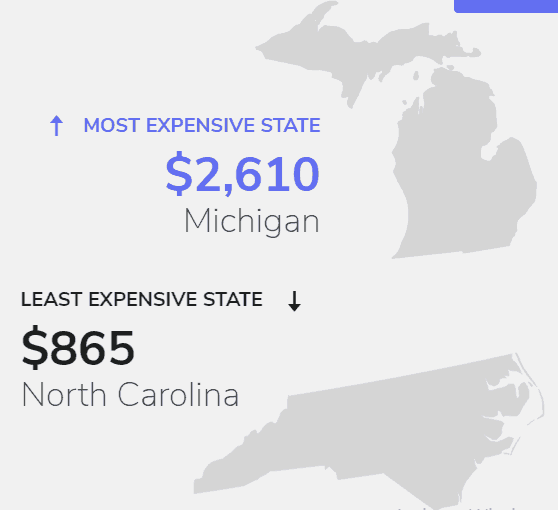 Like North Carolina, where the average auto insurance rate is a paltry $865. Now, when we cross over to Michigan, it becomes quite a hard pill to swallow. We’re already the highest in the nation, paying an average of $2,610 for auto insurance. Source: Zebra Things are even worse in some of the cities. Detroit drivers, for instance, are paying $5,414, on average. So, of course, it’s understandable to feel helpless when you learn that lease insurance might even be costlier than regular auto insurance. Fortunately, there are ways to reduce your overall premiums. Several, as a matter of fact. But, they are not universally applicable. Plus they don’t come easy at all. You see, each dealership has its unique lease terms. And insurance providers, similarly, have their own unique offerings with varying policies and corresponding discount rates. Securing a good rate, therefore, requires extensive shopping. And most importantly, working with a reputable independent insurance agency. They know where to mine for the most suitable discounts. ● The Rental Car Dealer Is Not Always Right And now back to our issue with the rental car dealer. There are many issues that dealers are quite conversant with. But insurance is certainly not one of them. The one you’re dealing with might attempt to include the lease insurance as part of the whole lease agreement. Of course, it might seem like a convenient package. But, don’t entertain the idea of signing it. Odds are the dealer could be making some commission off your insurance premiums. Although they are correlated, leasing a vehicle and purchasing lease insurance are two different things. Treat them as separate entities. They should never get mixed up. A good approach would be negotiating with different rental companies on their rates. Then engaging an independent insurance agency when it comes to the corresponding insurance. Conclusion To recap: ● Leasing has morphed into a different thing altogether. It’s not just for travelers and temporary drivers anymore. ● In the past five years alone, car leasing volume has increased astronomically by 91%. ● Millennials are particularly fond of this option. Of the lot that got new vehicles in 2016, at least 31% of them did it through leasing. ● On average, car buyers are now paying about $120 more a month than their leasing counterparts. ● Going by information published by Michigan State Police, more than half a million vehicles were involved in road crashes last year. And no specific type or model was spared. ● No one is exempted from the compulsory no-fault insurance. That usually forms the first part of lease insurance. ● According to the Department of Insurance and Financial Services, you’re considered the owner of a vehicle if you lease it for more than 30 days. ● All factors considered, lease car owners actually face more risks than you. A crash is only one part of the potential problems. They could still lose their vehicle through theft, fire or natural disasters. 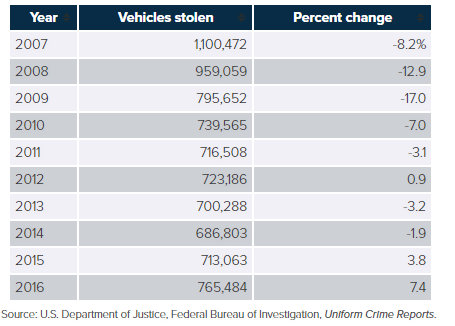 ● Cases of vehicle theft in the U.S have been increasing since 2014. After trending downward for 25 years. ● According to FBI’s Uniform Crime Report, thugs made away with 765, 484 vehicles in 2016. Translates to 239.6 cars for every 100,000 people. A disappointing 6.6% rise compared to the previous year. ● You’ll have to take insurance against two levels or risks. The no-fault insurance applies to you as the driver, while comprehensive insurance protects the car owners. ● There are ways to reduce your overall premiums. Several, as a matter of fact. ● There are many issues that dealers are quite conversant with. But insurance is certainly not one of them. That said, what kind of insurance did your dealer make you get for your vehicle?